Earlier this month, we enjoyed catching up with old friends and making new ones at the 2018 VFRI conference. This year in particular was incredible as I had the opportunity to chair the conference. I was inspired by the passion that my fellow fundraisers have for their organizations and for our profession. I was invigorated by the cutting edge trends and research that was shared by the presenters, and I was encouraged by the conference participants’ interest in trying something new to build stronger relationships with their donors and enhance their fundraising program. The closing panel focused on key trends in philanthropy, uniting panelists with diverse backgrounds to discuss a wide array of topics. In addition to our president and founder, Keith Curtis, we had the opportunity to hear from Stacy Palmer with The Chronicle of Philanthropy, Matt Nash who recently retired from Fidelity Charitable, Erin Hogan with US Trust and Sixto Council with Think of US. Trend 1: Donors, especially high-net -worth individuals, are being more strategic with their giving and looking for the greatest impact. For more on high-net-worth donors, read our insights on stewarding high-net-worth households. Nonprofit Tip: To attract and retain these donors, be able to demonstrate the outcomes of your work, increase engagement (tours, volunteer opportunities, ask for advice) and help advise them on ways to give to your organization. Demonstrating impact is more than listing stats and data. Check out Wendy McGrady’s thoughts on the topic in her blog post Let’s Talk Outcomes. Trend 2: 55% of households in the U.S. make philanthropic gifts. That number used to be 66% and the largest drop has been with mid- to low-level donors. Tax reform will likely further impact this group as many could choose to take the standard deduction and decrease their charitable giving. Nonprofit Tip: Think of creative ways to reach this subsect of donors beyond direct mail. Prioritize those with the most potential to become your future major donors and begin building deeper relationships to make your organization one of their philanthropic priorities. Also consider ways to make giving easier and more impactful for your mid- to low-level donors through monthly recurring gifts, giving societies, etc. Trend 3:​ Donor-advised-funds (DAF) continue to increase in popularity, accounting for 8% of all giving in 2017. Those that choose to give through this vehicle are typically more intentional and strategic about their donations than cash donors. For more information on donor-advised funds, read our article on decoding donor-advised funds. 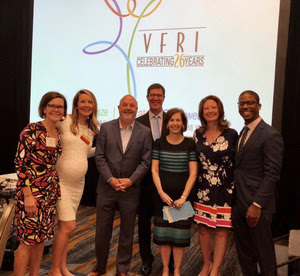 Whether or not you were able to be there in person this year, be sure you mark your calendar for next year’s VFRI conference July 24-25, 2019. If you are looking for more ways to grow your fundraising success, check out The Curtis Group services, and get to know our team to discuss campaign planning, campaign management, board development and more. We would love to meet with your organization.